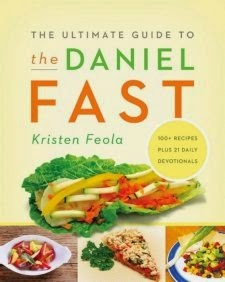 The author of The Ultimate Guide to the Daniel Fast originally set out to write a traditional cookbook, but a technical glitch wiped out her file. She set the book aside, meaning to come back to it, when her church leaders asked everyone to go on a 21 day fast. Because many people were uncertain about what they could or couldn't eat during the fasting period, the author pulled out her old cookbook notes and began posting recipes on her blog. This was the beginnings of this book. The book is divided into three sections: The Fast, The Focus and The Food. The first part discusses the purpose of the fast: to forge a deeper connection with God by participating in a spiritual fast. The author describes this process as "setting aside your basic physical desires for spiritual ones." She uses the Biblical story of Daniel, who fasted for 21 days by eating only the most basic foods required for survival. It is this type of fast that she is attempting to re-create. Physical and spiritual preparations for before, during and after the fast are also given. Part two of the book gives daily devotions and additional suggestions for readings. Part three takes up the majority of the book: the food! The section begins with a list of foods that are allowed and foods that are to be avoided. The allowable foods include fruits, vegetables, nuts and oils, while meat, dairy and sweeteners lead the list of banned foods. There are suggested meal plans, preparation tips and recipe combination suggestions. The recipes are divided into Breakfast, Appetizers and Snacks, Salads and Salad Dressings, Soups, Vegetables, Main Dishes and Juices. The recipes don't include nutrition information in the form of calories, fat, etc. but since most of the foods are probably pretty low in these areas, it's not much of a problem. There are some color photos of prepared dishes in the middle of the book that look very yummy! This book would be a good starting point for anyone looking to eat more healthy foods and to find new ways to prepare dishes that are lower in fat and calories. The recipes look very tasty and the ingredients list at the back of the book will make compiling a shopping list easy. Disclaimer: I received a copy of The Ultimate Guide to the Daniel Fast from BookLook Bloggers in exchange for this review.